It started off as a library, and then grew like a giant cedar tree. A big group of Write to Read volunteers drove to the very remote village of Kyquot in early April to make a survey. They came back satisfied they have the skills and experience to create what is being billed as The Big Project. The library designed to improve aboriginal literacy has become a full-fledged Learning Centre, part of a Community Centre, which will be located right next to a new Big House. A $50,000 project has evolved into a $5 million project. It may be the model for many more similar projects to come. Kyquot is reached only by water taxi from Fair Harbour, a 45-minute ride across open ocean on the edge of the Pacific. Back it up. To get to Fair Harbour requires a two-hour bumpy ride over rough logging road from Highway 19 just north of the hamlet of Sayward , replete with giant logging trucks barreling down the road at high speed. To get to Sayward is a drive of 3 hours north from Nanaimo, where it’s a 2-hour BC Ferries crossing from Vancouver. 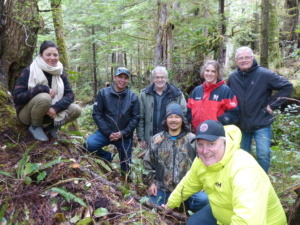 In attendance were team leader Bob Blacker, architect Scott Kemp, architect intern Kelly Bapty, mechanical engineer Mike Herrold, structural engineer Melissa Kindratsky, big log builder Steve Lawrence, filmmaker Michael McCarthy, financial guru Lawrence Lewis, and master carver Moi Sutherland. The crew stayed at the home of new W2R team member Susan Plensky and husband Skip. 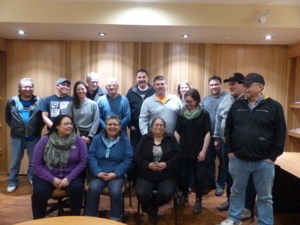 They met with a tribal committee including Chief Peter Hanson, committee member Daisy Hanson, band administrator Cynthia Blackstone, project coordinator Russell Hanson, and other committee members. The W2R team toured the village with architect Scott Kemp and it was decided the original site for the planned library was too close to sea level and at threat from any tsunami. An alternative site had been scoped out, so the entire team trudged up the hill past the school to the site of a planned new sub-division. The engineers decided an up close inspection was required and the entire team bushwhacked into virgin forest, where the biomass underneath was 10-feet deep. Big log builder Steve Lawrence announced the site was perfect for the harvest of the timber required to build the Big House and Community Centre. A mill could be purchased and installed right on the site, and logs and timber cut. The community could get involved in construction, saving a fortune required to import, house, feed and pay a full construction crew for the length of the project. Details of the entire project have been written and published in a PDF available for download. The first rough draft (there will be revisions) shows the Community Centre will include a Learning Centre, kitchen, meeting rooms for elders and youth, a museum, gymnasium and daycare. The committee was instructed that the entire village must be actively involved from the very beginning of the project, planning and fundraising. If the village does not pledge enough support and primary funding, the Big Project will not proceed. Fundraising will require a wide variety of events, grants, donations from the public and businesses. Financial planner Lawrence Lewis explained the costs in detail. The scope and success of the project depends on how much the community gets involved. Hiring outside construction crews are not part of the overall estimates.